We had two six year old Corgi/Dashund mix boys that we rescued from a shelter. They were our boys for another 6 years and then one went to rainbow heaven. Petie who was left behind was very lost without Simon so we started searching for a companion, and the breed really didn't make a lot of difference to us. Well, as things go I happened to find a Aussie pup for sale, she was the last one of the litter and a red merle. I did some research to find out about the breed and we decided to purchase her. She is a pure bred and the parents have their pedigree names, however we never planned to show her, just wanted her to have a wonderful happy life. Yes, she has captured our hearts and will not let them go. I have never had a furry friend as easy to train. She can be outside on our 5 acres all day with just hubby and I going in and out doing normal everyday things and she never leaves the property. The dogs next door can come out in the yard and she just sits in our yard and watches them. When we do say "go play" she will then go to play with the other dogs and return when we call her. Everyday I am in awe of her love and how she only wants to please us. Our little Petie (Corgi/Dashund) also went to rainbow heaven this May. 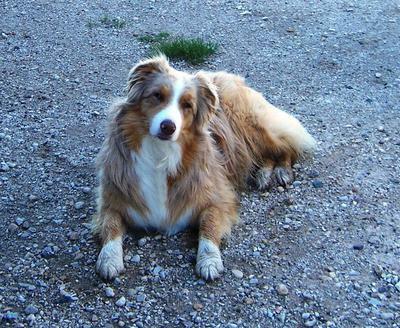 As Trip our Aussie is just a little over two and has accepted the loss of Petie we will be looking for a companion for her before she turns four. Oh! Trip was given her name because she took a trip from her place of birth to our home. Should have named mine trip as she had a 7 hr ride just after getting her.